I love making cupcakes. But what I love even more, is watching others in complete bliss as they enjoy my cupcakes. There is just something about creating a small, innocent looking dessert that will cause eyes to roll back in delight and moans of enjoyment. Yes, these cupcake recipes are THAT GOOD. So from one party planning hostess to another...Enjoy! Tip: One very important thing before starting the recipes. Do not use margarine in place of butter. It ruins the taste and does not hold up the same in the recipes as butter will. Preheat the oven to 350 degrees F. Line the wells of two cupcake pans with 24 paper liners. Place an Oreo half in the bottom of each liner, cream side up. In a medium bowl, combine the flour, baking powder and salt; stir together with a fork to blend and set aside. In the bowl of an electric mixer, combine the butter and sugar and beat together on medium-high speed until light and fluffy, about 2 minutes. Blend in the egg whites one at a time, beating well after each addition. Blend in the vanilla extract. With the mixer on low speed, beat in half of the dry ingredients just until incorporated. Add the milk and beat just until combined, then mix in the remaining dry ingredients. Gently fold in the chopped Oreos with a rubber spatula until evenly incorporated, being careful not to over-mix. Evenly divide the batter between the prepared cupcake liners. Bake for 18-20 minutes, rotating the pans halfway through baking, until a toothpick inserted in the center comes out clean. Allow to cool in the pans 5-10 minutes; then transfer to a wire rack to cool completely. To make the frosting, combine the cream cheese and butter in the bowl of an electric mixer and beat on medium-high speed until smooth, about 1 minute. Blend in the vanilla extract. Beat in the confectioners sugar until incorporated and smooth, 1-2 minutes. Add the heavy cream to the bowl and beat on medium-low speed just until incorporated, then increase the speed to medium-high and whip for 4 minutes until light and fluffy, scraping down the sides of the bowl as needed. Note: I had to add more sugar to make my frosting pipe easier. Frost the cooled baby shower cupcakes as desired. 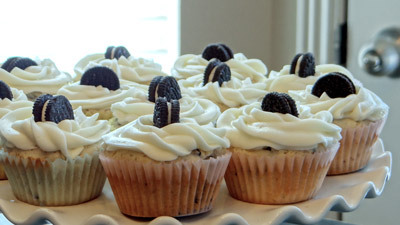 Sprinkle with Oreo crumbs and garnish with Oreo halves or mini Oreos. Combine the flour, baking powder, baking soda, and salt in a medium bowl and stir together. Add the dry ingredients to the mixer bowl on low speed, alternating with the milk, beginning and ending with the dry ingredients, mixing each addition just until incorporated. Blend in the vanilla. Fold in the chocolate chips with a spatula. Divide the batter evenly between the prepared cupcake liners. Bake for 18-20 minutes, until a toothpick inserted in the center comes out clean. Allow to cool in the pan 5-10 minutes; then transfer to a wire rack to cool completely. To make the frosting, beat together the butter and brown sugar in the bowl of a stand mixer fitted with the paddle attachment until creamy. Mix in the confectioners sugar until smooth. Beat in the flour and salt. Mix in the milk and vanilla extract until smooth and well blended. 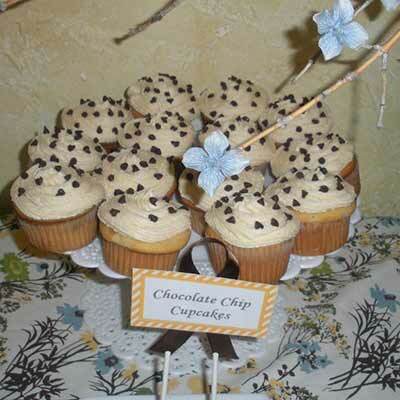 Frost the filled baby shower cupcakes as desired, sprinkling with mini chocolate chips and topping with mini chocolate chip cookies for decoration. Preheat oven to 350 degrees. Fill muffin tins with paper liners. In a large bowl, cream together butter and sugar until fluffy. Add eggs one at a time, beating well after each egg. Add pumpkin, beat well. In a small bowl, combine dry ingredients, sift together (I use a whisk to mix). Add to pumpkin mixture, alternating with buttermilk, and beating well after each addition. 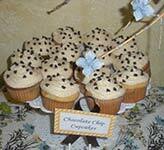 Bake baby shower cupcakes 10- 12 minutes or until a toothpick inserted in the center, comes out clean. Mix pudding and place in fridge to set. Fold in whipping cream, pumpkin and cinnamon. 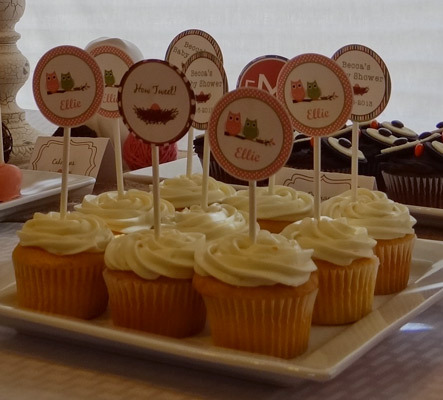 To fill the baby shower cupcakes, cut a cone shaped portion out of each cupcake. Fill the cupcakes and replace cone top back on cupcake. Frost. To make the ghosts above, I just used a standard buttercream frosting recipe and made it thicker with more powdered sugar so it would stand up well. The eyes are made out of black sugar pearls. Cream together the cream cheese and butter, until smooth. Mix in the vanilla; then gradually add powdered sugar until you reach the consistency you like. 2-24 hours ahead of time brown the butter with the vanilla bean. Run a paring knife down the center of the vanilla beans. Split them open and scrape out the seeds into a sauce pan. Add the butter and the scraped vanilla bean and turn the heat to medium-high. Cook the butter with the vanilla beans and seeds until the butter caramelizes and emits a rich nutty vanilla aroma. Remove the vanilla beans, dry, and save for another use. Refrigerate the brown butter until it solidifies, 1-2 hours. Preheat the oven to 350 degrees and position the rack in the center of the oven. Place the chilled brown butter in the bowl of a stand mixer with the paddle attachment and beat on medium high speed for 1 minute. Add the sugar and beat on medium high speed. Toward the beginning of the creaming process the mixture will look dry and seem as though it will never come together. Continue creaming, stopping the mixer occasionally to scrape down the sides of the bowl, until the mixture becomes fluffy and almost beige in color, 8-12 minutes. Add the whole eggs and yolks one at a time, continue to beat until they are fully incorporated and the batter looks smooth and glossy, 1-2 minutes. Add the vanilla extract. In a dry bowl, whisk together all the dry ingredients. With the mixer set on slow speed, add the dry ingredients to the butter in 3 parts, alternating with the cream and milk. Once you have added the 3rd portion, scrape down the sides of the bowl with a rubber spatula and briefly beat the batter on medium speed until just incorporated, 20 seconds. Portion batter into muffin tins (only 2/3 full please) bake for about 30 minutes. I used the caramel from my caramel popcorn recipe. Beat Butter, vanilla and sugar on medium-high speed for about 20-25 minutes until glossy and only very slightly grainy. Add 1 spoonful of caramel filling and mix to incorporate. Slowly add in powdered sugar, and mix until frosting has thickened enough to pipe. To make the baby shower cupcakes, preheat the oven to 325 degrees F. Line muffin pans with paper liners. In a bowl, combine the flour, baking powder, salt and lemon zest. Stir together with a fork and set aside. In the bowl of a stand mixer, beat the butter on medium speed until it is light and fluffy. Add the sugar and beat until well combined. Beat in the eggs one at a time, scraping down the bowl after each addition. Add half of the flour mixture to the bowl and beat on low speed until just incorporated. Add in the milk and mix until smooth. Add in the remaining flour mixture and mix on low speed until just blended. Fold in the fresh strawberries with a spatula. Divide the batter evenly between the paper liners, filling them about 3/4 full. Bake about 20 to 25 minutes or until a toothpick inserted in the center comes out clean. Allow to cool in the pan 5 minutes; then transfer to a wire rack to cool completely. 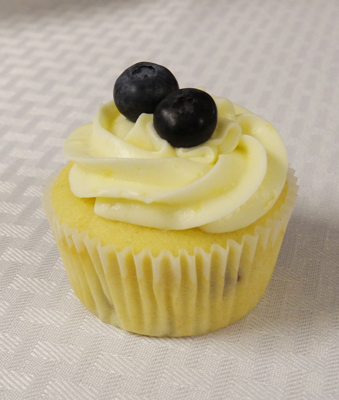 Once the cupcakes have cooled, whisk together the lemonade concentrate and confectioners sugar in a small bowl to make the lemonade syrup. Poke several holes in the top of each cupcake with a skewer and pour the syrup over the cupcakes, allowing it to soak in. 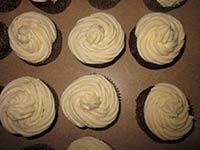 Frosting: Whip softened butter in a mixer until light and fluffy (2-3 minutes). Add strawberry puree and mix again until incorporated. Add heavy whipping cream, lemon concentrate and powdered sugar. Whip mixture for approximately 4-5 additional minutes on medium to high speed. If needed add a little more powdered sugar to thicken frosting. Frost cupcakes as desired and garnish with fresh strawberries and lemon slices. 1/4 cup lemonade concentrate, thawed. Clean strawberries and chop coarsely. Add sugar, cornstarch and strawberries to a saucepan over medium heat. Stir for a few minutes until thickened. Use spoon to crush strawberries while stirring. It turns into a deliciously yummy strawberry filling. Source: adapted from Annies Eats. 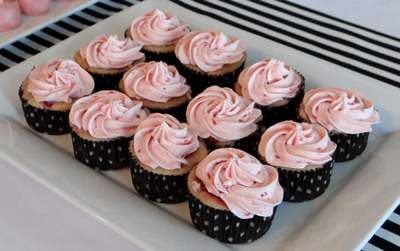 To make the baby shower cupcakes, preheat the oven to 350 degrees. Line standard cupcake pans with paper liners. In a small bowl, whisk together the cocoa powder and hot water until smooth. In a medium bowl, whisk together the flour, baking soda, baking powder, and salt; set aside. Divide the batter between the prepared cupcake liners, filling them about 3/4 of the way full. Bake 18-20 minutes or until a toothpick inserted in the center comes out clean, rotating the pans halfway through baking. Allow the cupcakes to cool in the pan 5-10 minutes; then transfer to a wire rack to cool completely. To make the filling, combine the chopped Snickers bars in a bowl with 1/3-1/2 cup of the caramel sauce and mix to coat. To make the frosting, add the butter to the bowl of an electric mixer. Beat on medium-high speed 1 minute until smooth. Blend in the confectioners sugar until smooth, 1-2 minutes. Mix in the vanilla, caramel sauce and salt until incorporated. (Note: the caramel sauce should be just warm enough that it is workable, but not warm enough to melt the butter in the frosting.) Add the heavy cream and whip on high speed until light and fluffy, about 3-4 minutes. Preheat the oven to 350˚ F. Line cupcake pans with paper liners. In a medium bowl, combine 1 1/2 cups all-purpose flour, cake flour, baking powder and salt; whisk together and set aside. In a mixing bowl, combine the butter, sugar and lemon zest. Beat together on medium-high speed until light and fluffy, about 2-3 minutes. Beat in the eggs one at a time, blending well after each addition. Beat in the vanilla, lemonade concentrate and lemon juice. With the mixer on low speed, mix in half of the dry ingredients just until incorporated. Blend in the milk. Mix in the remaining dry ingredients, beating just until incorporated. In a small bowl, toss the blueberries with the remaining 1/4 cup of all-purpose flour. Gently fold the blueberries into the batter. Divide the batter evenly between the prepared liners, filling each about 3/4 full. Bake 20-22 minutes, or until a toothpick inserted in the center comes out clean. Allow to fully cool. To make the frosting, beat the cream cheese and butter in the bowl of an electric mixer on medium high until smooth and fluffy. Around 2-3 minutes. Mix in the lemonade concentrate and lemon zest. Gradually beat in the confectioners’ sugar until totally incorporated, then increase the speed and then beat until smooth. Once cupcakes have cooled, frost them. 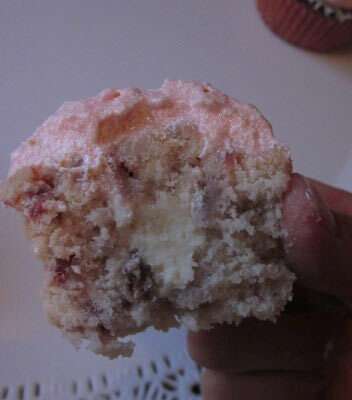 (I used wilton 1M tip to frost the cupcakes.) Garnish with remaining blueberries. Preheat oven to 350 degrees. Line muffin cups with cupcake liners. With an electric mixer, mix all of the ingredients on low speed until combined. Scrape down the sides and bottom of bowl. Increase speed to medium-high and beat for 2 minutes. Scoop into cupcake liners and bake 18-20 minutes, or until the cupcakes spring back when touched lightly with a finger. Cool completely. 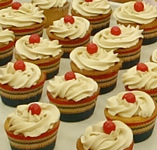 To fill the cupcakes, cut a cone out of the center of each cupcake with a paring knife. Fill with lime curd and replace tops back onto cupcakes. Frost cupcakes with cream cheese frosting. Sprinkle with sweetened coconut flakes. 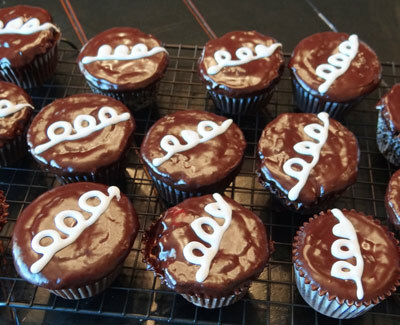 I used my large round tip to frost these cupcakes. 1 drop orange food coloring (optional). 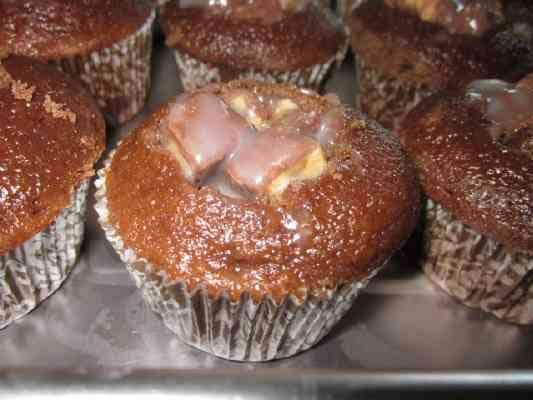 Using the directions on your cake box, prepare mix as directed, substituting 1/4 cup of the water for 1/4 orange juice. Add 1 teaspoon of orange extract and 1 teaspoon of orange zest. Mix well. Bake as directed in cupcake liners. Allow cupcakes to fully cool. 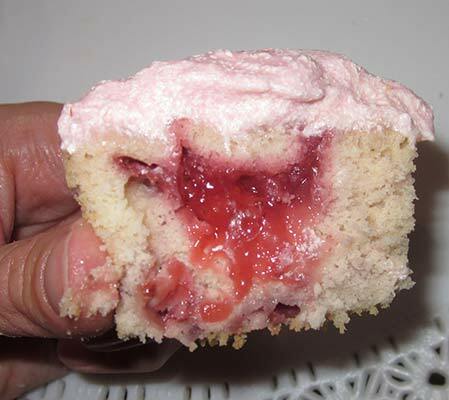 Using a small knife, cut a circle out of the middle of your cupcake, being careful not to cut all the way through to the bottom. 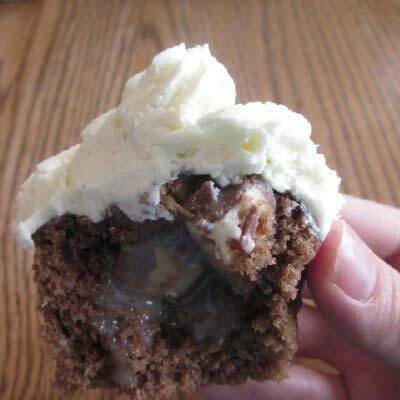 Place a spoonful of the marshmallow fluff in the cupcake and replace cupcake top back on. Continue filling all the centers of the cupcakes until they have all been filled. To make the frosting, mix butter in the bowl of an electric mixer until smooth and fluffy. Add cream cheese and mix until smooth. Add salt, powdered sugar, extracts, orange zest and juice, rotating between mixtures until all have been combined and mixture is smooth. Beat 1-2 more minutes until mixture is fluffy. You can place frosting in the fridge for 15 minutes or so if it needs help thickening up. 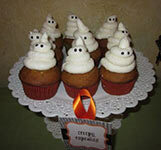 Place in piping bag and pipe frosting onto cupcakes. Enjoy!! 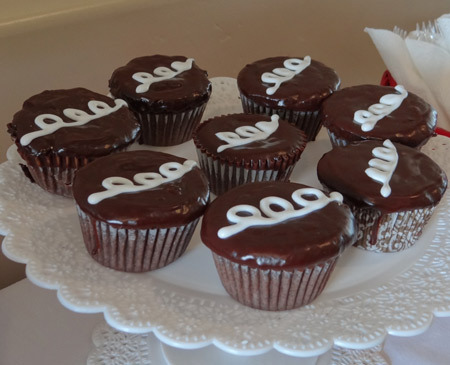 This is a fun recipe that looks just like hostess cupcakes, but it tastes SO much better! Preheat oven to 350 degrees. In a bowl, mix together flour, cocoa powder, baking powder, baking soda and salt. In a separate bowl, mix together egg yolks, canola oil, 1 1/2 cups of sugar and the water. Blend well. Stir the dry ingredients into the wet ingredients, mixing just enough to incorporate everything. In the bowl of an electric mixer fitted with a whisk attachment, whip the egg whites on medium to high speed until foamy. Continue to beat, gradually adding in the remaining 6 tablespoons of sugar, until stiff, glossy peaks form. Add a quart of the egg white mixture to the bowl of the batter to lighten. Gently fold the remaining egg whites until batter is smooth and no streaks remain. Divide batter between cupcake liners, filling each 3/4 full. Bake until cupcakes spring back when lightly pressed (16-18 minutes), rotating halfway through cooking. Allow to fully cool. Filling: Combine the marshmallow creme and butter in a mixing bowl and mix on medium high speed until smooth. Blend in confectioners sugar (powdered sugar) and salt and whip until mixture is light and fluffy (1-2 minutes). Reserve 1/2 cup of mixture to the side. Transfer the rest of the filling into a pastry bag. 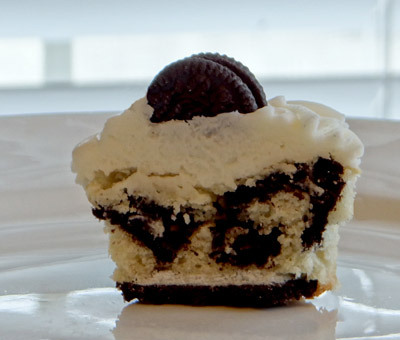 Using a paring knife, cut a circle core out of the middle of each cupcake. Pipe filling into the cupcake and replace top of cupcake back on. Repeat steps until all of the cupcakes have been filled. Glaze: Place chocolate in a small heatproof bowl. Bring the cream to a simmer in a small saucepan over medium heat. Pour hot cream over chocolate and let stand 1-2 minutes. Whisk together until a smooth ganache forms. Let cool for a few minutes. 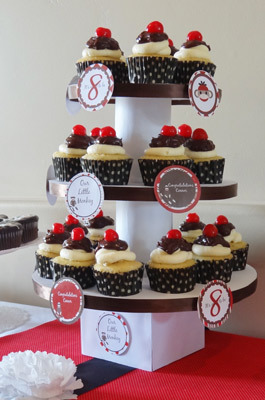 Take the cupcakes one at a time and dip the tops into the melted chocolate. Transfer cupcakes to a wire rack and allow the glaze to set. 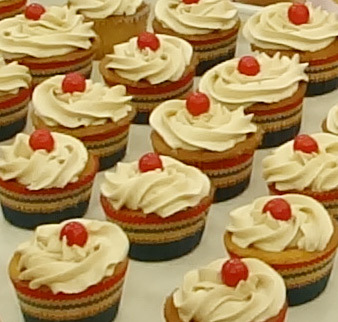 Once it has set, use the reserved filling to pipe a swirl on the top of the cupcakes. Preheat oven to 350 degrees. In a medium bowl, mix flour, baking powder and salt with a fork. Set aside. In the bowl of an electric mixer with a paddle attachment, cream together butter and sugar at medium high speed until light and fluffy (around 2 minutes). Add in eggs, one at a time, scraping down the bowl as needed. Mix in mashed banana until well combined. Slowly add dry ingredients, mixing until barely incorporated. Divide mixture between cupcake liners and bake for 20-22 minutes, until toothpick comes out clean. Allow to cool completely. Filling: Mix diced strawberries in a bowl with 2 tablespoons of powdered sugar. Set to the side for about 20-30 minutes. Cut a circle core out of each of the cupcakes. Spoon a small amount of strawberry mixture in each cupcake. Top with a teaspoon of crushed pineapple. Frosting: Add the heavy cream to a chilled bowl of an electric mixer fitted with a whisk attachment. Whip on medium high speed until soft peaks form. Add powdered sugar and continue to whip until still peaks form. Blend in vanilla extract. Place frosting into a piping bag with a large pastry tip. Pipe a swirl onto each cupcake. Chill for 30 minutes. Ganache: Place chopped chocolate in a small heatproof bowl. In a small saucepan, bring cream to a simmer over medium heat. Pour hot cream over chocolate. Let stand 1-2 minutes. Whisk together until ganache is thick. Blend in corn syrup. Let sit at room temperature 10 minutes to cool down. Pour a spoonful of ganache over chilled frosting on cupcake. Garnish with maraschino cherries. 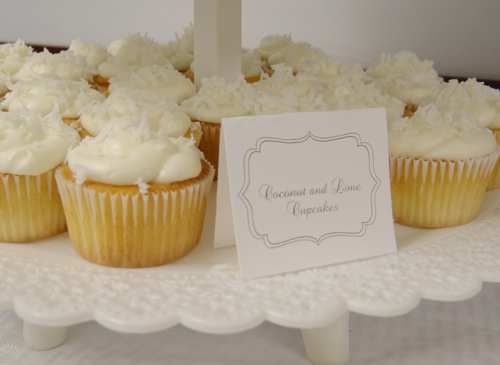 Want to see more baby shower cupcakes? 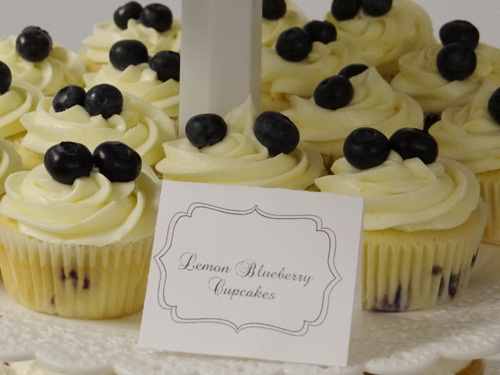 View our reader photo gallery full of baby shower cupcake ideas! 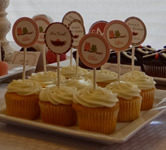 Return from the best baby shower cupcakes to the baby shower food index. Get more great baby shower ideas.